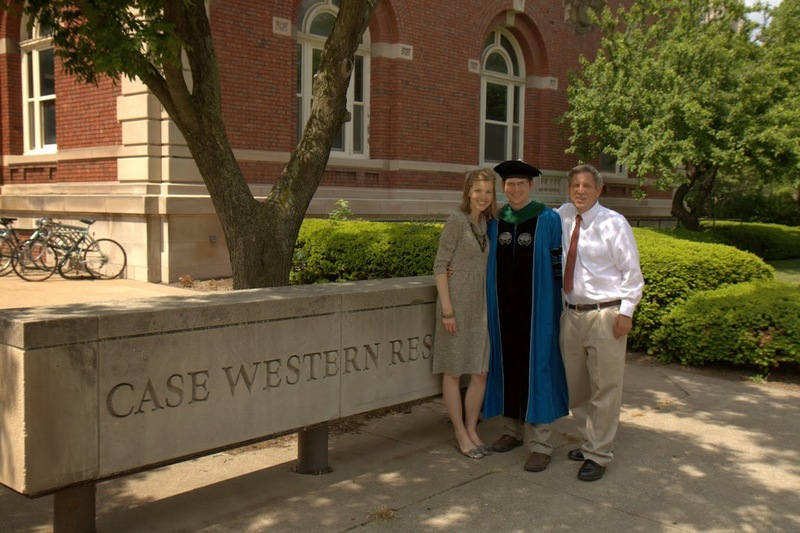 May 19, 2013 Tom received his MD and graduated from Medical School. Despite a heavy dose of jet lag, we were both very glad we made a point of attending his graduation. We also felt very grateful to have Tom’s dad, Stan, there for support. I was surprised by how overcome with emotion I became when Tom marched in with his classmates, robed and grinning broadly. I teared up as I waved, blew kisses, and beamed back. Tom has been pursuing his MD since I met him (though he took more than half of those years to get a PhD.) Nine years all culminating in one afternoon ceremony rich with tradition, emotion, and honor. Tom was one of six to graduate in the Medical Scientist Training Program, a government funded program to support medical researchers. Entrance into this program is highly competitive despite its rigor. When Tom tells people about his nine year program they usually gasp in shock. That turns into disbelief when he tells them he is yet to be finished with his training, a probable seven more years lie ahead of him. And yet, what astounds me is the joy and excitement with which he lives each proceeding year of training. I felt so proud of Tom for his stamina, for his resiliance, for his humility, for his service. It’s easy sometimes, as a wife, to see your husband’s job as a nuisance that takes him away from you and strips him of his energy and time. I’ve appreciated, over the past two years, reading the comments and reviews his attendings and residents have given him. They’ve spoken of his willingness to learn, his aptitude as a team player, his humility, his genuine love for his patients, his diligence in continued education, and his obvious passion for medicine. Patients have asked him to pray with them, deliver their babies, and perform their surgeries. (None, besides the first, that he could really do.) And yet, I’ve seen Tom question his intelligence, doubt his abilities, and fear for his furture more this year than ever before. Thinking of all these things I wept, as my heart overflowed with pride for my best friend, my husband, my Tom. Nine years ago, I moved to Cleveland to start my new life as a medical student. I moved from Milan Italy, and had no idea what to expect. Turns out, I can’t imagine a better place to have spent the last decade. Cleveland was fun, affordable, and filled with good people. I met my wife Kjirsti, married, had our son, wrote my dissertation, got a few patents, explored the east coast, learned how to sail boats, enjoyed delicious restaurants, witnessed incredible performances, flipped a mansion of a house, and learned how to be a halfway decent pediatrician. The day after graduation, my dad, brother and I strolled out of town in a 22 foot Penske truck with everything I own. The feeling is bittersweet. I have had so much Joy in Cleveland. I love my friends there, especially Brandon and Anne who have always been there for us, even in our last few hours of packing. I will miss this life I have enjoyed. As I went to sleep my last night in cleveland, I was brought to tears remembering cherished moments we had in our home. As I pondered our time there, my mind was brought back to some of the things I learned in Tibet last week. Buddhists believe that life is full of suffering, and that it is not necessarily a bad thing, just the reality. Suffering is life; it causes us to appreciate the time we have on earth; it changes us, working on our souls. They also teach that nothing in life is permanent. As I met with Tibetan people, they demonstrated a joy so rarely found in the USA, a land of material abundance (especially when compared to Tibet). Those teachings resonated with me. Life is so beautiful, even the tough parts. I know we are going to create a great life in Seattle. I can’t wait to reconnect with old friends there, and to make new ones. I can’t wait to play with my son in the myriad of parks and forests. I heard once that we have every age we’ve lived inside ourselves. Trapped inside a 95 year old man is that successful 40 year old, that powerful 25 year old, that curious four old, and that sweet 2 year old. I will forever feel that part of me is still a medical student in Cleveland, surrounded by a community which I will cherish forever. Thank you kind friends, you will be forever missed. Kjirsti, This is Martha. You heard from Michelle. I hope you are liking Seattle. We lived there while Jes worked for Boeing, right out of graduating from BYU. Our fourth son was born there and had to spend time in the hospital because he had “pyloric stenosis” which required surgery, We loved Seattle. That is where we met when Jes was on his way to the Korean War–where he learned about the church and was baptized in the Tokyo Mission home. We have a granddaughter living there now. Her name is Jessica Morrise Wise – married to Jordan whom she met at BYU. She works for Google, recently did recruiting for them on the BYU campus. Hope to hear from you. Previous Previous post: Tibetan children- I want one! Next Next post: Cross Country Road Trip!